There has been a certain amount of speculation on internet websites as to who Joseph Gomoszynski is but no one seems to know anything about him. Using various sources it has now been possible to find out a little about him and his family in Britain. Judging by his age at death Joseph was born c1813, probably somewhere in Poland. 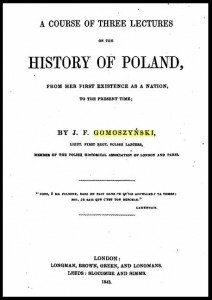 On the title page of a book he published in 1843 he describes himself as a lieutenant in 1st Regiment of Polish Lancers. At the beginning of the book he says that he fought in the November Uprising of 1830/31 against the Russians, was imprisoned by the Prussians, left his native country in 1832 and eventually arrived in England in 1836. His arrival in England in 1836 is recorded on a passenger list listing Aliens arrivals. He came to London on 12th July 1836 from Danzig on the ship Lachs and is described as being from Poland but as travelling on a Russian passport. It was specifically noted that this was the first time he had come to England. Nothing further is known about Joseph until his marriage to Jane Hughes of Liverpool is announced in the Greenock Advertiser. The couple married on 30th December 1839 at St John’s Episcopal Church, Greenock. The couple did not remain long in Greenock as their first daughter, Catherine Stanislove, was born late in 1840 in Leeds, probably in Headingley where Joseph, Jane and Catherine are found living, at North Lane Headingley, next year when the census was taken. The census entry confirms that Joseph was of foreign birth and tells us that Jane, though English, had not been born in Yorkshire. The only other piece of information is that Joseph gives his occupation as Professor (no less!) of Languages. 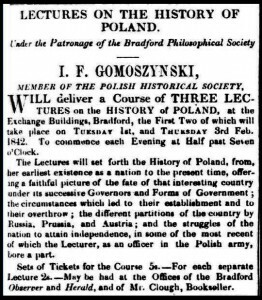 Around December 1841/January 1842 a series of adverts in the Liverpool Mercury and the Bradford Observer show that Joseph gave a series of three public lectures on the History of Poland. 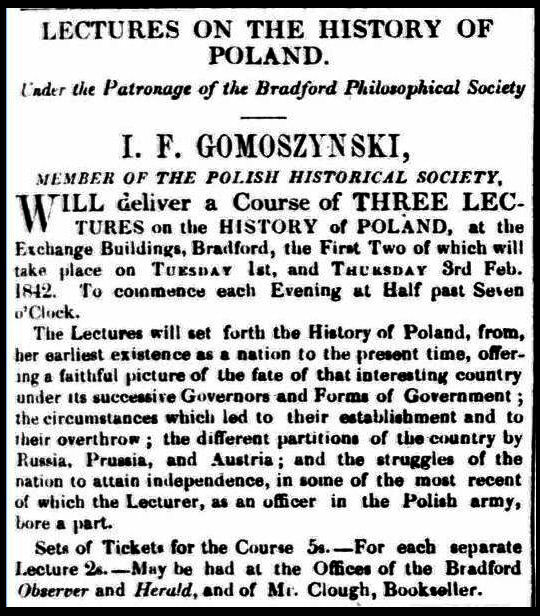 These lectures were later published, in 1843, as A Course of Three Lectures on the History of Poland: From Her First Existence as a Nation, to the Present Time and priced at 3s 6d. Another daughter, Emily Jane, was born in Leeds in 1842 but by 1845 the family was back in Greenock at 4 Boyd Street. However they may not have come directly from Leeds to Greenock as an entry in Hutcheson’s Greenock Register and Directory for 1845-46 suggests. Under French and German Languages and Literature, an entry for Lieutenant J. Gomoszynski, describes him as “late Master of the Modern Language Department, Stanwix Academy, Carlisle”. It is not known when or for how long Joseph taught at Stanwix Academy but as he feels it worth mentioning in this directory entry in 1845 it seems likely he had been there immediately before arriving at Greenock. Two further children were born to Joseph and Jane in Greenock: Joseph Francis Dudley about August 1845 and the mysterious Casimir Thomas who, from later evidence, may have been a twin of Joseph junior, or a younger (posthumous?) brother born 1845-1846. The family did not remain complete for long as Joseph senior died at his home, 4 Boyd Street, Greenock of a heart aneurism on the 27th October 1845 at the early age of 32 years and was buried in the Necropolis, Glasgow on 1st November. Nine months later on 15th July 1846 his infant son Joseph junior died of whooping cough at the same address in Greenock and was buried beside his father in the Necropolis on 18th July. Those are the only facts that have been gleaned so far about the life of Joseph Gomoszynski and they are not sufficient to put much flesh on his bones without indulging in a certain amount of speculation. No records have so far been found for him in Poland and one has to rely on what he, himself, says about his early history. 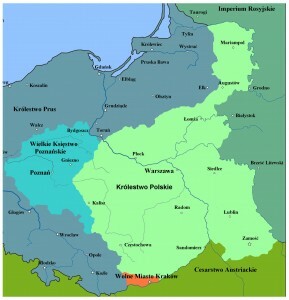 Joseph was probably born in that part of partitioned Poland under Russian rule known as Congress Poland. He can only have been about 17 when the November Uprising (29th November 1830 – 21st October 1831) started in Warsaw. The revolt was led by young Polish officers and cadets from the military academy in Warsaw and Joseph’s age and the fact that he describes himself as a lieutenant in the 1st Regiment of Polish Lancers would certainly fit the scenario that he was a cadet at the academy. After bitter battles against the numerically superior Russians the last 20,000 men of the Polish army crossed into Prussian Poland on 5th October 1831 and laid down their arms there rather than surrender to the Russian authorities. The Prussian authorities interned the men and expelled them from Prussian Poland in groups of 50-100. This could fit with Joseph’s description of being imprisoned in the Fortress of Weichselmunde near Danzig (now Wisłoujście near Gdansk) before being forced to leave Poland in 1832. 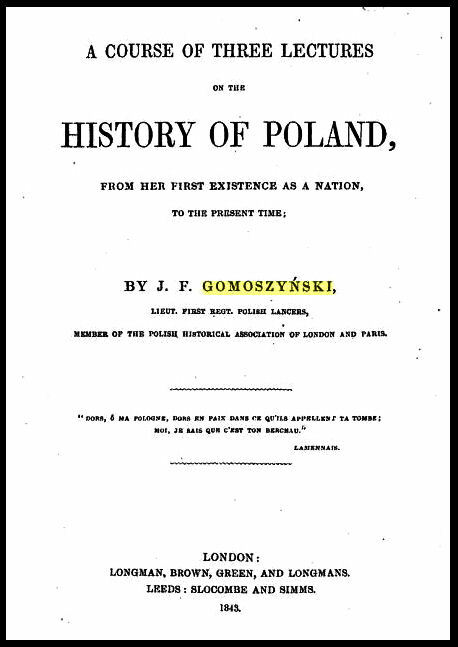 It was mentioned above that Joseph published a slim (96 pages) book in 1843 under the title A Course of Three Lectures on the History of Poland: From Her First Existence as a Nation, to the Present Time. At the front of this book are two pages listing 91 persons who subscribed for one or more copies of his book. Presumably some of them had attended his lectures of December 1841 or February 1842 and it is interesting to speculate how many of them he might have known personally. The subscribers fall into three distinct groups: 58 from Leeds, Bradford and Otley (for 66 copies), 20 from Greenock (for 38 copies) and 5 from Liverpool (for 27 copies), plus a scattering of singletons. The 58 subscribers from Yorkshire can be accounted for by the fact that Joseph was living in Leeds when he gave the lectures and the 20 from Greenock may reflect the fact that he was living in Greenock by the time the book was published. It is also notable that it is to a Greenock man, John Denniston, that the book is dedicated (and John Denniston subscribes for 10 of the Greenock copies). Four of the subscribers need more attention. Colonel K Lach Szyrma in Devonport subscribed for 1 copy. Lach Szyrma (1790 – 1866) was a Polish philosopher, writer and journalist, translator and political activist. He was a Professor of Philosophy at the University of Warsaw when the November Uprising broke out and was appointed colonel of a regiment. Like a number of his compatriots he came to Britain after the Uprising finally settling in Devonport. The other Pole on the list is Lieutenant Constantine Ordon of Greenock. This may be Julian Konstanty Ordon (1810 – 1887) who commanded one of the redoubts defending Warsaw from the Russians. Julian Ordon was of a similar age to Joseph and it seems very likely they knew one another. The third subscriber is Lord Dudley C. Stuart who was an influential member of the Literary Association of the Friends of Poland co-founded in 1832 by Thomas Campbell, the poet. It may be significant that one of Joseph’s sons is named Joseph Francis Dudley. The fourth subscriber is Mrs. Hughes of Liverpool who put her name down for 18 copies. Bearing in mind that Joseph married a Jane Hughes of Liverpool there seems no doubt this is his mother-in-law doing her bit to support him; there are also 3 Miss Hughes listed in Liverpool and Greenock and a Mr. James Hughes in Monte Video who between them subscribed for another 10 copies, surely more family members. Lastly one has to try to answer the question: why was this Polish refugee buried in the Necropolis and a stone put up to commemorate him? Why was Joseph not buried at Greenock? A burial lair in a good position in the Necropolis was not cheap in 1845 and neither was a stone monument. Did his widow, or her family, have enough money for the lair and stone or did someone else pay for it? It seems likely that Joseph was a member of the Literary Association of the Friends of Poland judging by the names of some of the subscribers to his book and this society had a branch in Glasgow known as the Glasgow Polish Association. He described himself as a member of the Polish Historical Association of London and Paris on the title page of his book and one could speculate whether these two bodies rallied round to make sure he had a seemly burial and commemoration. 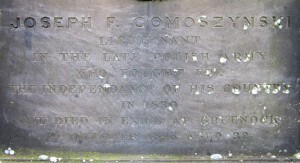 Jane Hughes or Gomoszynski born Liverpool 1812/3; died Conway, Caernarvonshire Apr-Jun 1877. Catherine Stanislove Gomoszynski born Headingley, Leeds, Oct-Dec 1840; died Marylebone, London Oct-Dec 1919. Emily Jane Gomoszynski born Headingley, Leeds Apr-Jun 1842; died Droitwich, Worcester Jul-Sep 1897. Joseph Francis Dudley Gomoszynski born Greenock August 1845; died Greenock 15th July 1846. Casimir Thomas Gomoszynski born Greenock 1845/46; died Cricklewood, Middlesex 25th March 1928. When Joseph Gomoszynski died in 1845 he left a widow, Jane, and four children. It has been possible to find out a little about what happened to Jane and her children after Joseph’s death to try and complete the story of this family. It has already been stated that Joseph junior died the year after his father and was buried beside him in the Necropolis. There is then a gap of about fifteen years and no trace of the family until 1861. At the census that year Jane and her two daughters are living in Marylebone, London. Interestingly Jane gives her occupation as school mistress which matches that of her husband previously, though there is no indication of what she taught. There are three boarders in the household which might suggest Jane was hard up and taking in boarders to help make ends meet. On the other hand she can afford to employ three live in servants – cook, kitchen maid, and housemaid. Ten years later Jane and her younger daughter Emily are living on their own at Llandrillo, Caernarvonshire and Jane dies there or close by in 1877. Apart from these two appearances in the census nothing more is known about Emily and Catherine until they die: Emily in 1897 at Droitwich, Worcestershire and Catherine in 1919 in the district of Marylebone, London. This leaves the mysterious Casimir Thomas Gomoszynski. He is a mystery because the first record of him is in the 1881 census when he is already 35 years old. His unusual surname, the fact that this census records him as being born in Greenock about 1845/6 and Emily and Catherine’s later links with the Heslop family (see above) are the only pieces of circumstantial evidence to suggest he is a son of Joseph senior. At the census in April 1881 Casimir is visiting Charles and Hannah Lee and their youngest daughter Mary Adeline Beaumont at Morpeth, Northumberland. It turns out that Casimir is engaged or about to become engaged to Mary Lee as the couple marry that October in Morpeth. Helpfully he gives his occupation in the census as a civil engineer and Burgh Surveyor at Tynemouth.